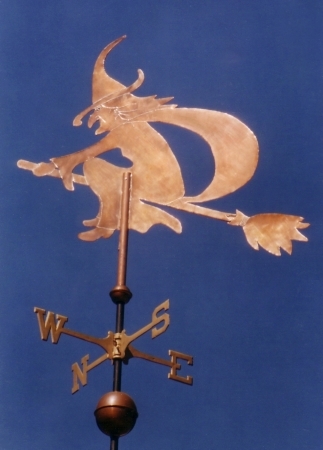 Our customer for this Hanging Bat Weathervane, was inspired when he saw our Bat Family Weather Vane which had been commissioned by a family with two children. 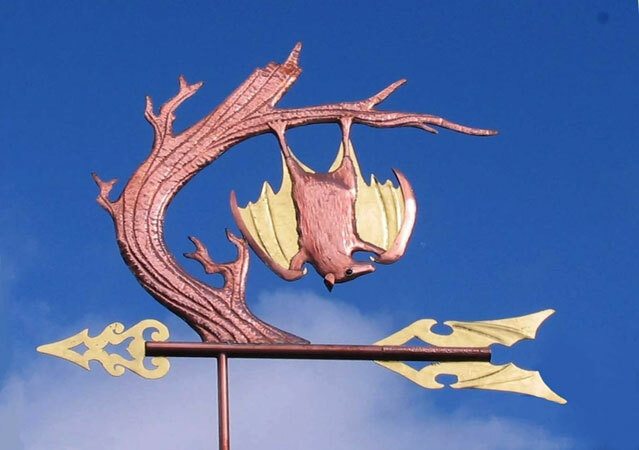 He ordered his single bat in the small (one-foot sculpture piece) size and mounted it on his deck railing. This kind of personalizing from an existing design is something we do a lot. 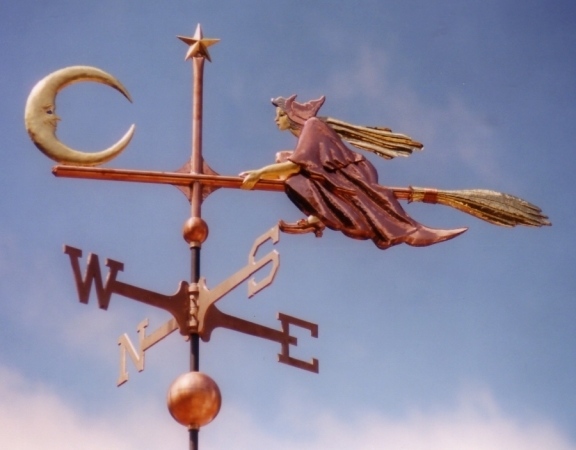 We truly enjoy working with our customers to create the sculpture that resonates for them and their lives. We recently finished a version of this design for a couple in France who reside in an area with numerous bat colonies. 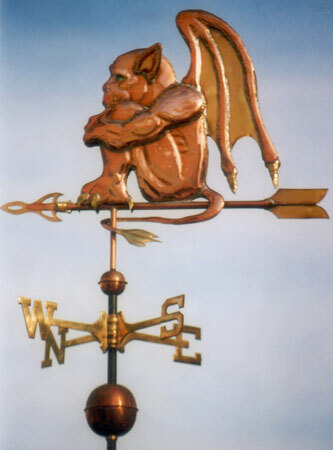 Interestingly, many of the customers who order our Bat Weather Vane order other complementary weathervanes at the same time. 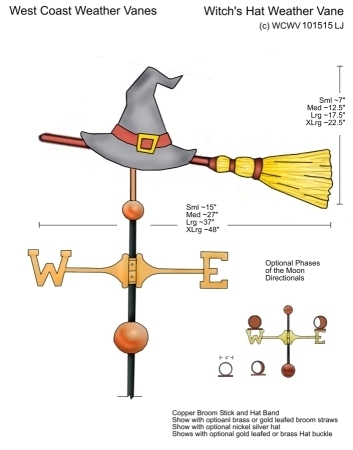 One customer ordered a Raven Weather Vane and another customer ordered a Dragonfly Weather Vane to accompany their bats. 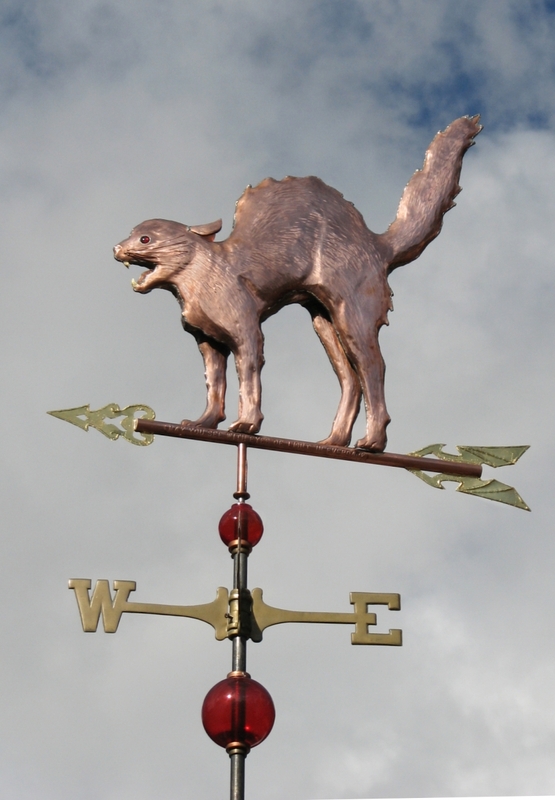 We have also crafted a bat themed weathervane for Janell Cannon, the author of the wonderful children’s book Stellaluna. 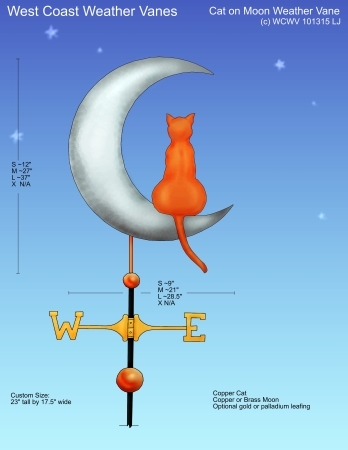 For this commission, along with the bat we added characters from some of her other books including ‘Verdi The Snake’ and Thrup from ‘A Fuzzhead’s Tale’. 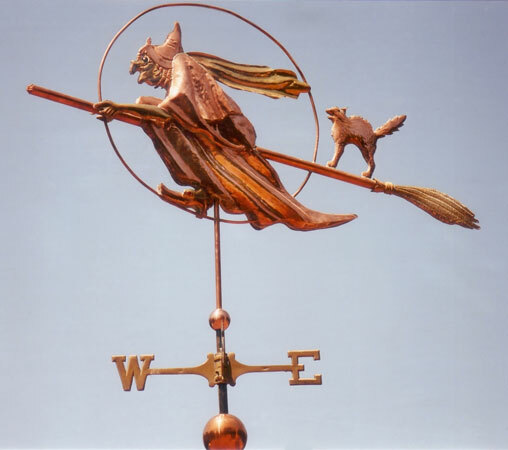 Our Witch, Scary Cat and Bat weathervanes are also very popular with people whose birthdays fall on Halloween or they just love this memorable holiday. 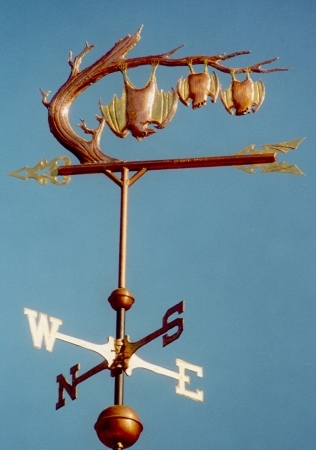 The Bat Weather Vane featured here has brown glass eyes with black pupils and optional gold leaf on the bat’s inner wing panels as well as on the scrolled arrow tip and fletching. The arrow fletching was designed intentionally to mimic the distinctive shape of bat wings. The bat’s forelimbs are detailed to accentuate their development as wings. Bats are the only mammals in the world naturally capable of true flight (other mammals, such as flying squirrels and gliding flying possums, can glide for limited distances). A bat is a mammal in the order Chiroptera. The word Chiroptera comes from the Greek words cheir ‘hand’ and pteron ‘wing’, as the structure of the open wing is very similar to an outspread human hand with a membrane (patagium) between the fingers that also stretches between hand and body.